Recommendations for lunch near the Parkway Theater, Oakland? Looking for someplace to lunch near the Parkway Theater in Oakland on Saturday. Not sure exactly where that is yet, but it is somewhere in East Oakland I think. The New Parkway? If so, that’s in uptown. Around there open for lunch on Saturday I like Pican (though haven’t been to lunch/brunch), Trueburger for a good fast food-ish burger, Hopscotch, and Luka’s. Have also read good things about Taiwan Bento on this board, which is also close by, but haven’t been. If you’re talking about where the old Parkway was, Champa Garden is pretty close. If the other places Mr Happy already mentioned aren’t of interest, Chinatown and old town are not too far away. One BART stop or the equivalent of getting from Montgomery station (where there are limited Saturday lunch options) to the ferry building. The New Parkway is in Uptown on 24th Street, a few doors east of Telegraph Ave. About a block east is Calavera on Broadway near 24th Street. 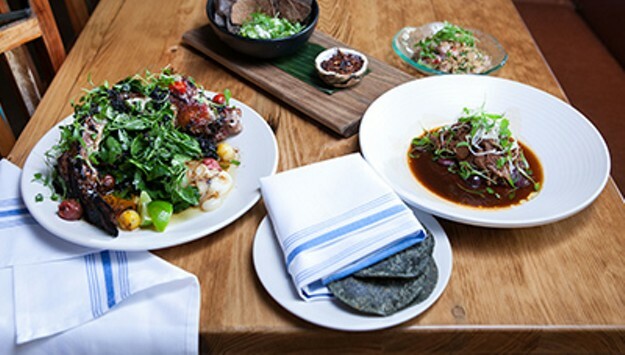 Haven’t been but sounds interesting for regional Mexican and is open for lunch on Saturdays. Calavera aims to change how Americans define "authentic" Mexican. Also on Saturday afternoons many of the small art galleries near Telegraph on 23rd, 25th and 26th Streets are open. Every Sat. 1-5pm. A quieter and more focused time to view art and visit OAM Galleries. Mua is a short walk away. And yeah, not much further is the Hive and all the Uptown restaurants.